The offer is valid for dine-in only, and is not valid in Connecticut or Rhode Island. It is not available during lunch. Among the offerings are Cold Water Lobster Tail, Lobster Roll Sliders and Fries, Cold Water Lobster Tail Dinner and Steak Topped with Lobster Thermidor. Bonefish Grill writes about the Cold Water Lobster Tail "'So then I said... "If you really knew me, you'd know that I'm from the cold waters of the North Atlantic and that I'm wood-grilled, seasoned and served with butter for dipping.' Honestly. Check my Facebook page!" It costs $7.90. The Lobster Roll Sliders and Fries entry reads "I had this dream once that I was enveloped by soft, warm toasted brioche buns. Like being hugged by rich, buttery pillows. Then I realized I was awake. And forever changed." In other words, it's lobster chunks on a "mini authentic New England roll". It costs $7.90. The Cold Water Lobster Tail Dinner entry reads "My best friends are a Bonefish salad and a fresh side. Like three musketeers waiting for an adventure. We cannot be defeated. Many have tried." In other words, it's seasoned lobster served with your choice of a House or Caesar salad and a fresh side. Sides are Asian Vegetables with Sauce, Asian Mixed Vegetables with Sesame Oil, French Fries, Fresh Greens, Garlic Whipped Potatoes, Herbed Jasmine Rice, House-Made Chips, Potatoes Au Gratin, Pumpkin Ravioli, Steamed Asparagus, Steamed Broccoli, and Steamed Vegetable Medley. It costs $12.90. The Steak Topped with Lobster Thermidor entry reads "A passionate tale of forbidden love - so steamy, so indulgent, that it can only be expressed with a 6 oz wood-grilled sirloin and sweet lobster, lump crab, a velvety sauce with a hint of sherry, and garlic whipped potatoes. Or maybe it was a filet for +$6? Either way." In other words, you can make your steak a filet for an extra $6. The dish costs $16.90. Bonefish Grill lists the nutritional profile of each dish on its web site. 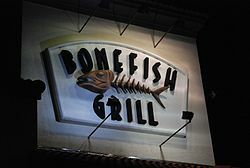 Bonefish Grill, according to Wikipedia, was founded in St. Petersburg, Florida, and is headquartered in Tampa, Florida. It is owned by Bloomin' Brands and has restaurants in 28 states. Wikipedia notes "Bonefish Grill's procurement process is guided by the reports and recommendations of the National Oceanic and Atmospheric Administration and issued government regulation. The chain actively pursues sustainable practices through the research of ocean status, product authentication, global trends, biomass, annual catch limits, changing fish migrations, and aquaculture production methods and sources."